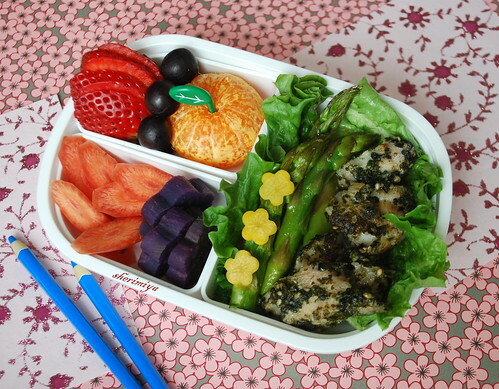 Furikake Fish Bento, originally uploaded by sherimiya ♥. I know, I know. Usually you make furikake salmon or furikake mahi mahi, like I had in this bento. But, I thought I would try it with wild cod, since it was available in my market, and I figured since it is a mild-tasting fish the furikake would give it a nice shot of flavor. 1. Spread the fish with mayo. 2. Sprinkle generously with furikake. 3. Fry in butter until done, then flip. That's it! Fillets like salmon and mahimahi hold together well, but cod tends to fall apart so it ended up being more like chunks of furikake cod. But actually this works out well for kids, since it's easier for them to eat like this anyway. For this bento I lay the fish on some lettuce, added some garlic roasted asparagus, and decorated with tiny yellow carrot flowers. I also gave him maroon carrot sticks and Okinawan sweet potato flowers. In the fruit section he has a strawberry, grapes and a mini mandarin. the pencil chopsticks are super cute, nice touch with the yellow sweet potato flowers. Pshaww! Furikake cod is awesome and sounds like a superb combo. Nice... real nice. beautiful, colorful, & inspiring! Love the little yellow flowers. yummers - that cod looks awesome. i love the three little yellow flowers on the asparagus, what a pretty and sweet detail. and the fruit section is perfectly arranged. a well-balanced meal and a rainbow of colors, as usual! Thanks a lot Debra, Susan B. and megan!! Your bento is so beautiful and colorful! I am jealous of your purple sweet potato! Thanks a lot Jenn and Lia! I defenitely have to try that recipe!!! :D Thank you so much! Your Bento looks so yummy! I love your bento today. I know what furikake is from Just Bento but I have not tried it yet. After seeing this bento I'm thinking of trying it with tilapia which I cook a lot. It is mild in taste too and could use a bit of a kick at times. 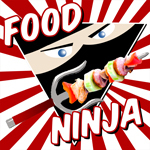 I am new to your blog but am simply amazed at your creations! They are so inspiring. What a labor of love to your children. :) Thanks for sharing w/ the rest of us. If I may ask a quick question...are all of your lunches intended to be eaten at room temp? I always wonder about this as we do not have access to heating up our kids' lunches at school. Thanks Token! Not really a recipe but I hope you can try this simple idea! Thanks so much for stopping by, and for your kind words! All these bento are made to be eaten at room temp. Most schools do not provide a microwave for kids, so I would guess that many kids bento are the same. Some use a thermal container for soups and stews, but for the most part my kids like their food RT! If I use perishable items such as mayo, and during the summer, I also toss an ice pack into his insulated tote. Hope this helps! Tried the furikake cod but it turned out terrible. The furikake did not stay on the fish at all. Sorry to hear that. Like I mentioned, cod is not a firm-fleshed fish, so it tends to fall apart during cooking. You might have better luck with salmon or mahimahi filets or steaks. These fish hold their shape well when flipped. Make sure you use kewpie liberally, to keep the furikake adhered to the fish. Alternatively, you might cook the fish without furikake and add it later, at the end of cooking. Hope this helps. I'm giving this a try tonight with some Tilapia (was hoping for mahimahi but couldn't find it anywhere). Is the butter just to keep it from sticking to the pan? Laura, yes the butter is just to prevent sticking. You may be able to omit. I haven't tried tilapia, so good luck! I hope you enjoy it. Oh it was delicious! I ended up flipping it sooner than I should have(my first time cooking fish, was paranoid about burning it haha) so it got a bit messy. But it tasted wonderful. Thanks so much for the recipe!